Tumi walking down the aisle. (PHOTO: Supplied). Larona Moagi spills all the details of what you can expect on the wedding episode on The River tonight. 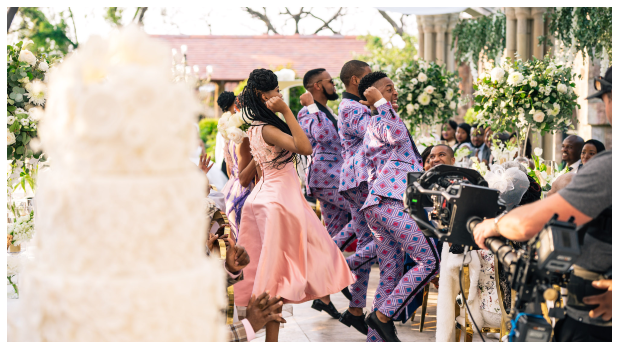 Wednesday night will see one of TV’s most anticipated weddings come to life as Tumi Mokeona (played by Larona Moagi) and Zolani Dlamini (played by Lawrence Maleka) finally get married. 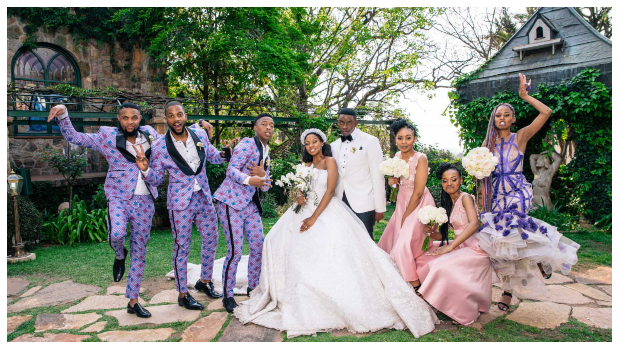 While seeing the two rival families come together for the celebration is something viewers can look forward , the fashion is not something to be missed either as renowned South African fashion designers such as Gert-Johan Coetzee, Scalo the designer as well as other designers have designed some of the main character's outfits. 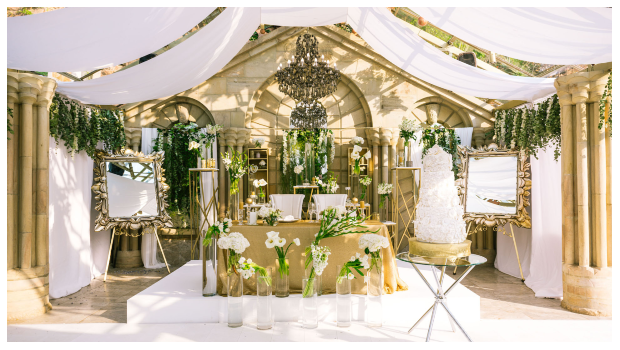 Gert-Johan Coetzee -- who designed Tumi's gorgeous wedding dress also made a cameo in Monday nights episode which truly brought the episode to life. 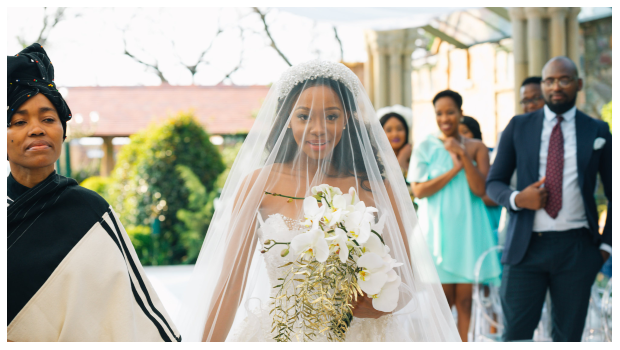 We caught up with Larona Moagi and she detailed her experience while shooting the wedding scene. 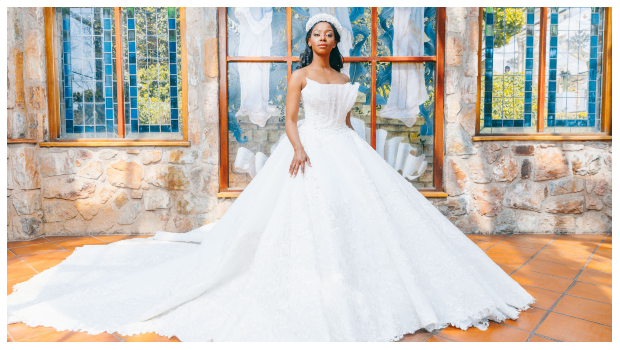 We caught up with actress Larona Moagi who plays the bride-to-be on 1Magic’s series The River and asked her a few questions about her experience during the wedding scene. How did you feel being in a Gert-Johan Coetzee dress? I have been seeing wedding gowns which are done by Gert, so for me it was always a dream. If this could ever happen for me personally I think it was always a matter of I’d cough up a couple of racks to wear this Gert-Johan dress but here it is and I’m playing a role and I’m wearing it on screen and it’s a wedding dress as well. 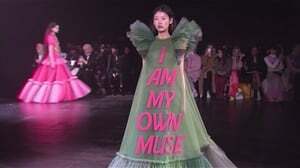 So it was really exciting I was like, ‘girl capture each and every minute of the experience’, it was very exciting – I felt like a princess in it. How did Tumi feel about getting married to Zolani? I don’t know how to say this without giving too much away… she was very happy, she was getting a wedding every girl always dreams of but it had its challenges. That’s all I can say right now without giving it away. Yho! The different obstacles that love goes through, expect to see a love triangle and the dynamics that the love triangle will bring. So there’s still a lot of drama, a lot of fun but it’s still so beautiful. How do you feel about the episode and the buildup of the episode? I’m still so excited to see it on screen tonight, shooting it was exciting. Like I said wearing the Gert dress was just ‘oh my gossh’ – phenomenal for me. Having the cars, you know…just the feeling it of it being a real wedding, it was really exciting, shooting on location and all. I think everything to top it off as the character I would say I felt honored and I was really-really excited that the whole team entrusted me with that. So I had to step things up performance wise and everything… but everything was so exciting I had so much fun. How was the entire wedding experience for Tumi especially with the two rival families there? Weddings are supposed to bring the families together and usually after the lobola negotiations there should be some sort of unity between the families. That’s something I think everyone will see tonight that there is a unity and it makes the whole experience better in that, here are these two families coming together to share the union of these two people. So overall there wasn’t the acidity that usually exists on The River in terms of the different families, everyone was there and they were supportive to the two people who were getting married…the experience was very calm. Now that Tumi is married what can expect from her character? Tumi is transitioning, I feel – she’s in a state of transition, she’s getting introduced to a different lifestyle and a life she had never known and that’s the life of money. Her character gets tested here like, how do people behave in light of money when they’ve never had it before? So her character is going to evolve somewhat in the light of money. In closing I would really encourage everyone to please watch tonight, have a box of tissues and some chocolate! Here is a sneak-peek of the wedding of the television wedding of the year.